The restaurant site is located less than half a mile from Ground Zero and the 9/11 Memorial. It’s got five stories, a skylight and a rooftop terrace. And when it opens in winter of 2018, the new Chick-fil-A in New York City’s Financial District will be the fast food chain’s largest location ever. The brand just announced plans to bring its third restaurant to Manhattan next year. Located at 144 Fulton Street, the new location will offer unimpeded views of 1 World Trade Center and plenty of other unique design elements that customers will get to experience with their chicken. According to a press release sent to TODAY Food, the roughly 12,000-square-foot space will be nearly twice the size of any other Chick-fil-A restaurant in the country. Each of the five levels will have floor-to-ceiling windows, providing bright and airy sunlight exposure for all diners. Plus, when the weather is nice, guests will be able to sit on the scenic rooftop while enjoying their meals. With three levels of dining, the restaurant will be able to hold a whopping 140 guests. There’s also going to be a semi-private group meeting and dining space that will have white boards and cork boards for employee training and meetings. But the space may be available for other groups in the future, too (sounds like a great place for a delicious company off-site!). 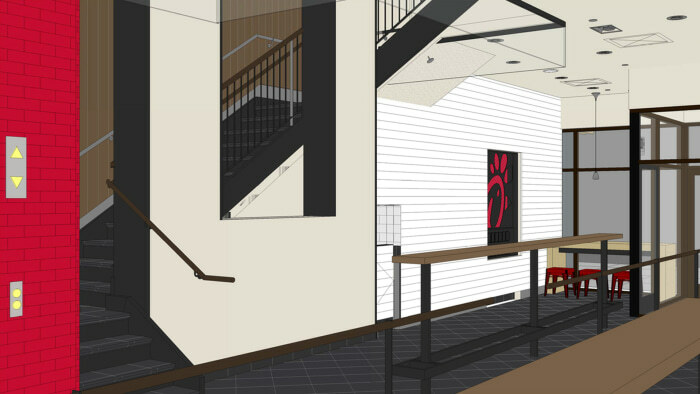 Though the restaurant is five stories, at only 15 feet wide, this will be the narrowest Chick-fil-A ever built — the extra levels just make it much larger than the others overall. The restaurant site is located less than half a mile from Ground Zero and the 9/11 Memorial, so according to the company, some of the design is made to "respectfully pay homage" to the significance of the location. The team building the new restaurant, led by Nathaniel Cates, design manager for restaurant development at Chick-fil-A, came up with the idea to stack the front of the building with glass windows and elements built into the façade that give a subtle impression of the Twin Towers.